The fall season is quickly approaching so come take advantage of a few of the specials that Salon Sora is offering to revitalize your summer weary hair back to it’s healthy, shiny, vibrant condition. At Salon Sora we offer a multitude of hair conditioning treatments that will restore the shine and luster that sun, beach, and pool strips away. Treatments run between $10 and $35 so there is one for every budget! Try our Dosage Treatment which will help smooth and calm the cuticle layer of your hair and reduce frizz and split ends. This treatment will also help restore some of the shine that your hair once had. This treatment takes approximately 30 minutes so an appointment would be needed. This is an all natural treatment with no chemicals or harsh additives. Be sure to ask to have Puma apply your treatment. You will be happy that you did! Your cost- $25, regularly $30. Salon Sora is a Goldwell hair color salon where we offer a selection of leave in instant conditioners from Goldwell that are applied to clean, damp hair and help to add instant shine, silkiness, and color fastness to your tresses. These can also be purchased for weekly at home conditioning treatments. This is one of the best instant conditioners that I have ever used. Phyto of Paris has an entire array of different treatments that help with hair loss, dandruff, dullness, dryness, breakage, frizziness. ALL Phyto treatments are botanically based with no chemicals or artificial additives. If you have never experienced a Phyto treatment now would be the time. The Salon Sora 2015 special fall/winter price is only $25, regularly $40. Come treat your hair and your senses with these beautiful, aromatherapy based treatments! These treatments also take from 15 to 30 minutes so an appointment would be necessary. Ask your salon coordinator or stylist which treatment is best for your hair. Olaplex. If you haven’t heard of this miraculous new product you are in for one very happy surprise. This latest technology will take even the most damaged hair and restore shine and luster like you once had. This new product reforms the broken disulfide bonds in damaged hair and makes your hair silky, shiny and tangle free. This picture is taken with an electron microscope to show the difference between hair treated with Olaplex and hair that has not. 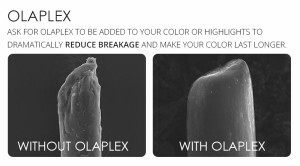 Olaplex was developed as an addition to color and bleach formulas to ensure the integrity of the hair with each of these services but it can be used alone as a conditioning treatment for even the most damaged hair. This is one product that has the entire hair world buzzing! Come in to Salon Sora today and leave with the radiant, beautiful hair you once had.